Last year, Dropbox raised a whopping $250 million funding round at a valuation in the ballpark of $4 billion. The raise had been rumored for months so it didn’t come as a huge surprise, but it still raised plenty of eyebrows. Because while Dropbox is totally awesome (I use it every day), at this point people see it as a convenient way to sync their files between computers — which it already does pretty well. So what’s all the money for? Today, we’re getting our first taste of what’s next, and what cofounder and CEO Drew Houston calls Dropbox’s mission to solve all of the “hidden problems” that people have with technology, many of which we’ve simply become accustomed to dealing with. Their first solution to one of these hidden problems? 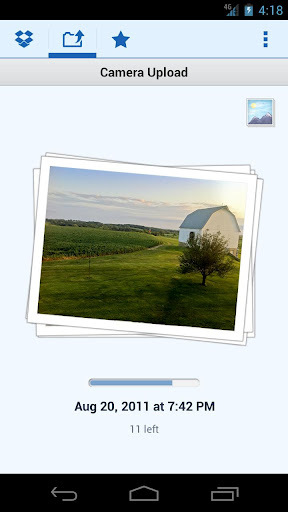 Helping you keep all of your photos, from all of your devices, in one place. And to get things started, they’re launching a new version of their Desktop and Android clients that’ll automatically upload your photos to your Dropbox account. Snap a few photos on your phone, and, without having to hook up any wires, they’ll be on your computer within a minute or two. I’m pretty sure they saw it coming. The first thing they pointed out is that there are a lot of people out there who aren’t using either of those services. Most Dropbox users aren’t using Macs at all, so iCloud is out of the question (actually, iCloud will work with Windows if users install the iCloud Control Panel) and Google+ is still just getting started (yes, the service has lots of users signed up, but how many of them are using it and have the app installed on their phone?). Dropbox also does a couple of things that Google+ doesn’t: for one, it’ll automatically sync the full-sized version of your images — Google+ sync will downscale images to 2048px at their longest edge. And Dropbox can also sync any photos it detects on your PC: if you plug in a camera or SD card into your computer and it detects images, you’ll have the option of automatically adding them to your Dropbox folder. This new feature could potentially eat up a significant amount of space in your Dropbox folder, so Dropbox will also be gradually boosting the limit for free users from 2GB to 5GB (they won’t do this all at once — as you use the photo feature, you’ll be able to gradually accrue more free storage). Houston explains that the goal of this feature is to make life easier for people, not to get them to upgrade to larger Dropbox storage limits, which is why they’re offering the additional free space. It sounds great, and I’ll be enabling it immediately, but there are still some obvious areas for improvement. Images that are synced to your Dropbox account are placed in a special Photos folder, but they’re just sorted in chronological order — there isn’t any intelligence around event or location detection, for example. Another potential issue is that Dropbox doesn’t offer any tools for managing or editing these photos, so it’ll be up to you to drag them into iPhoto or another photo editing app (the best solution will likely be to make your Dropbox folder your default image folder). Houston agrees that they’re just beginning to scratch the surface of what’s possible here, so I’m sure we’ll see improvements soon. Oh, and don’t worry iOS users — Dropbox will be updating its app to include this functionality soon as well. It’s worth nothing that, while this is the first time Dropbox has baked this functionality into its official app, it’s been possible to do the same thing on Android using third-party applications that take advantage of the Dropbox API. Of course, the official app has a much bigger install base.